Students and officials at the Palo Alto High School are reeling after custodians found racist graffiti on lockers, doors and water fountains. The hate messages were written with a permanent marker and included a derogatory message about the "Black Lives Matter" movement. Others read, "Trump 1237," referring to the number of delegates the Republican presidential hopeful needs to win. "It’s language we find insensitive and troubling," said Jorge Quintana with the school district. "That’s why the school is looking into it and contact police." The messages have been painted over, but students say the messages still hurt. Many hope that whoever is responsible will confess. "I thought, as a school and community, we’re better than that," student Wes Walters said. His mother Brandi Walters agreed. "That’s very disappointing," she said. This week, students have been celebrating "Change in our School Week," which focuses on respect and tolerance. The school community is even more incensed over the timing of the incident. "Students have the right to speak their minds, but I think they did it in a really destructive and hurtful way, and I’m upset that a Paly student would do that," student Alissa Bernstein said. 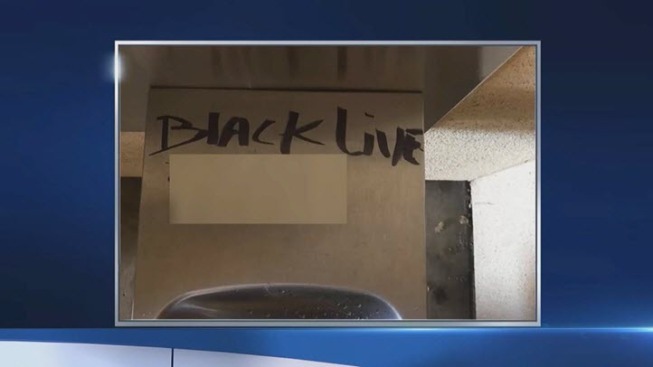 Police don’t know yet if a student is responsible for the graffiti, but the school district stresses that it has a zero tolerance policy for this type of behavior. Detectives admit that they haven’t turned up any leads and asked anyone with information to call the school district or police.